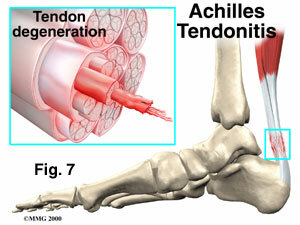 Achilles tendinitis is an inflammatory condition of the Achilles tendon, which is the largest tendon in the body. This tendon connects the calf muscles to your heel bone and is used when you walk, run, and jump. This tendon can become inflamed when there is a sudden increase in activity and is also often associated with an underlying biomechanical problem like over pronation and/or tight calf muscles. Over pronation occurs when your foot rolls in too much during your gait (walking/running) cycle and thus the tendon starts to pull excessively at the bony insertion at your heal and becomes inflamed and painful. Pain is just your body trying to warn you that you need to take care of it before something worse happens such as an Achilles tendon rupture, which will require immediate surgery. The poor blood supply to the tendon makes it susceptible to injury and a slow healer. Patients with Achilles tendonitis usually experience the most significant pain after periods of inactivity, such as the first thing in the morning upon getting out of bed. Often treatment will include night splints to avoid the shortening of the calf muscles at night. Patients will also experience pain while participating in activities, such as running or jumping. Achilles tendonitis pain associated with exercise is most significant when pushing off or jumping. X-rays are usually normal but calcification of the tendon can appear on the lateral film if the patient has had the problem for a long time. Occasionally, an MRI is needed to evaluate a patient for tears within the tendon. 2. Night splints – keep the feet in a dorsiflexed position so the calves cant shorten up at night. 4. Increase duration of exercise by ONLY 5-10% per week. This applies to intensity as well.